Stijn Alsteens International Head of Old Master Drawings, Christie’s. Bonaventura Bassegoda Catedràtic, Universitat Autònoma de Barcelona. Sculpture, 1500-1800, The Cleveland Museum of Art. article, with at least two images of the object itself and appropriate comparative images. Gail Feigenbaum Associate Director, Getty Research Institute, Los Angeles. Peter Humfrey Emeritus Professor, School of Art History, University of St. Andrews. Seventeenth-Century Art, former Director, Ashmolean Museum, Oxford. Paul Joannides Emeritus Professor of Art History, University of Cambridge. Alastair Laing Former Curator of Pictures and Sculpture at the National Trust. Università degli studi della Campania “Luigi Vanvitelli”, Naples. Painting and Sculpture, Los Angeles County Museum of Art. Painting and Sculpture before 1900, Toledo Museum of Art, Ohio. Centre for Studies in British Art, London. been included in this publication improperly, please contact the Foundation. writing from The Colnaghi Foundation. 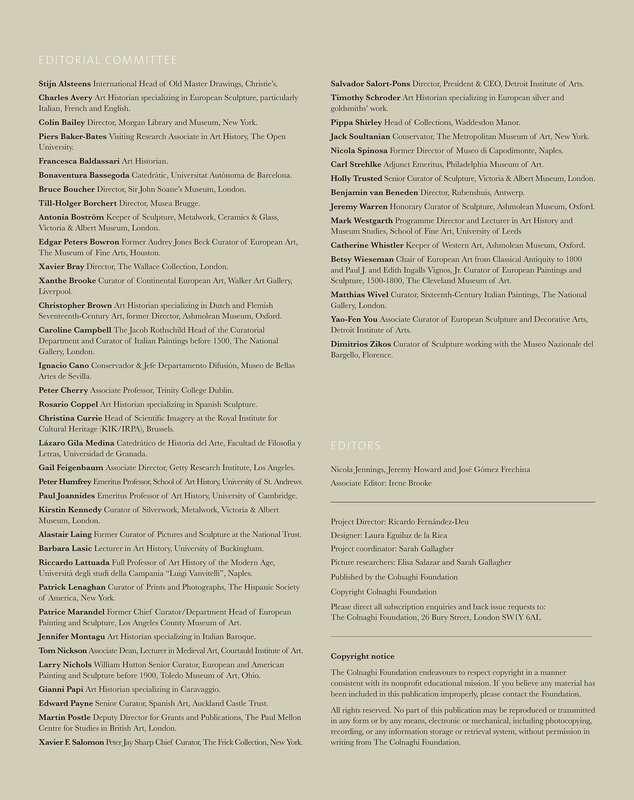 Manuscripts are reviewed by the Journal’s Editorial Commitee. They may be submitted, complete including illustrations, at any time. his or her article appears. submission. Please do not embed images within text documents.